As an app reviewer, most of my reviews are heavily based on my previous experiences with playing games. Sure, some things only exist because of the iPhone/iPod’s technology such as jump-distance games, but most of the time, you can trace any app to a previously more traditional game. Demon Hunter is a side-scrolling action RPG that pits you, a random boy warped into an alternate dimension, up against demons, mythical beasts, and magic users. Demon Hunter, released by BiCORE Co., ltd, is available on the iPhone, iPod touch, and iPad for an introductory price of $0.99. Just take a look at the screenshots. This is clearly inspired heavily by Castlevania. The dark gothic environments, the different magical attacks, weapon switching, and leveling system… it’s a throw back to that classic platformer/action RPG. You jump on platforms and attack enemies, accept quests from people with giant bright exclamation marks hovering over their heads, and level up to improve your stats and power your special attacks. Graphically, there are different level themes like sewers or forests, unique special attacks, and tons of different enemy sprites. You have a small ‘base’ where other characters hang out and all of them have unique and well done sprites of their own, some enemies are extremely detailed, almost at the level of Castlevania, and the portrait arts are extremely well done. Graphically, this is a pretty good presentation. You have options for changing the size of the controls, and the option to slow or speed up the game too. My favorite part of Demon Hunter comes from the fact that almost all your equipment will change your character sprite’s physical appearance during gameplay. Very nice touch. Controls are on a different level than graphics however. I really wished that Demon Hunter was less frustrating so that I could enjoy the game, but this is just a fundamentally flawed structure. First, you cannot jump through platforms. Instead, you have to rely on a double jump and the directional pad to guide your jump around most platforms. There are constantly areas where you cannot make a jump without the help of an elevator rock that floats up and down between the platforms. You’ll spend most of your time constantly re-climbing platforms clumsily while hitting your head against the platforms, no matter what the size. The level designs also need improvements because there are a whole lot of dead ends that are filled with respawning enemies. Imagine climbing a poorly laid out area to enter a new room that ends up at a dead end with no items or quest goals… then having to work your way back down and into another area. 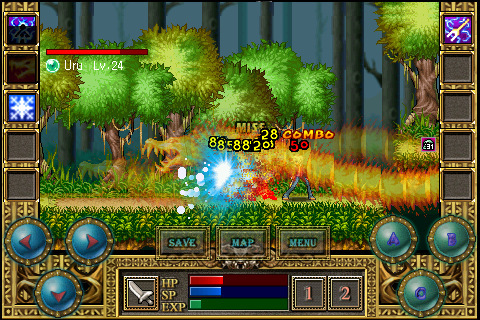 The enemies are another cause of frustration along with the level design. Take the control issues and put the quest goal as far away from the player as possible. Now, at early levels, you won’t have any health-regeneration items and the only real way for you to regain health is to level up by killing enemies. Now, what would happen if you were trying to jump up platforms falling off constantly, and you give all the enemies infinite resurrections after a few seconds? Seconds?! Enemies will come back after being killed every 5-20 seconds depending on your game speed option. Your health never regens, but enemies constantly come back to deal damage to you. 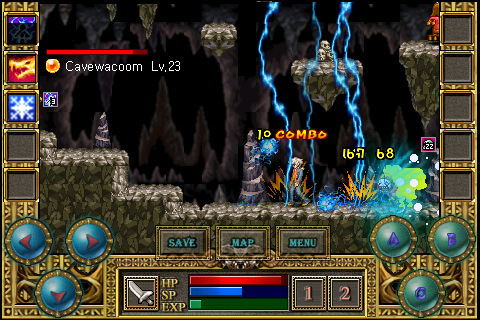 It’s lucky that you can literally walk through enemies without taking damage so you can actually run past most of the incredibly annoying never-ending enemies, because without this ability, I would have dropped the game in a few quests since the game loves to send you into difficult to reach areas with lots of platforming, send you back to the home base, then send you right back to where you were. Translations for the game are also very sketchy. Whoever they got to translate has issues with dialog. Your character will always break up a conversation by asking redundant questions. “We need to get to area B from area A.” “Area B?” “Yes, area B is the place where enemy A is at.” “Enemy A?” Now imagine that for nearly every line of dialog in the game with missing words, misspellings, and grammatically confusing sentence structures. Story narration is slowly paced with bad translations, the characters are sometimes written inappropriately to their design, and the respawning enemies combined with the stiff and unresponsive controls made this one of the most difficult apps for me to work through. Improvements to controls (maybe a joy stick alternative), making enemies respawn only after you leave the screen, and giving the game to native English speaker to have them translate the dialog and descriptions into English would be great. As it is, Demon Hunter was just the grind part of World of Warcraft and it’s only redeeming factor is in the excellent art design, though that cannot save a gaming application. AppSafari review of Demon Hunter – The Return of the Wings was written by Joseph Ho on November 26th, 2010 and categorized under Action, App Store, Games, Platformer, RPG. Page viewed 12933 times, 2 so far today. Need help on using these apps? Please read the Help Page. Whoever wrote this review needs to stop blaming their own inabilities on the game. Almost all of his “frustrations” with this game are directly related to his lack of understanding and what I assume to be poor hand-eye coordination. Your assumption is inaccurate. Maybe you should assume that after so many apps, my hand-eye coordination for gaming is pretty much set. The game has control issues, platforming issues, and poor level design at parts. My frustrations came from the lack of precision found in so many other games of the same gameplay style and other games of different gameplay styles. The iPhone buttonless interface requires a bit more from developers for comfortable playing. I finished this game and didn’t enjoy it. You happened to like this? Fine, but don’t mistake poor design for a user’s inability. There wasn’t much to ‘understand’ about the game. Thanks for the feedback though. I’ll remember it when I… no, no you need to stop assuming things about others just because you like throwaway titles like this and can’t justify the cost to yourself.